It has been an unusually busy past couple of weeks for me but this weekend particularly so. I have barely had time to sit down with a book, but that is what I have planned for the rest of the afternoon. There is no ending so perfect to the weekend as spending a grey, wet Sunday afternoon curled up with a book, a pot of tea, and the knowledge that everything you needed to do has been done. I have been reading Jane Ridley’s wonderful biography of Edward VII, Bertie, but for some reason I find myself unable to really get into it. It is an odd feeling, especially since it is such a well-written and brilliantly researched book. On every page I learn something new and Ridley’s writing is excellent. But…what? I am not sure. I have never been much interested in Bertie, despite my fascination with other members of his family, which could be part of the problem. As much as I have enjoyed what I have read, I have been deeply frustrated by my inability to sit down with this book for any lengthy period. I think I shall probably put it aside for now and come back to it in a few months, when I can do it justice. The fault here lies entirely with me and not with the book. In order to kick-start my reading after my struggles with Bertie, I have reread Kristan Higgins’ Just One of the Guys, breezed through Dodie Smith’s Autumn Crocus, and am blissfully working my way further and further into Trollope’s Orley Farm. The perfect antidote, it turns out, for what ailed me. But most of my entertainment this weekend has been decidedly non-bookish. On Friday, I went to the theatre to see Boeing-Boeing, a 1960s farce about a businessman in Paris juggling three fiancées – all air hostesses – whose foolproof plan for keeping them all separate falls apart when their flight schedules are disrupted. The play itself is hilarious but the physical comedy in this production was what made it. It has been a long time since I laughed so hard. On Saturday, I finally saw Quartet. The film is set at a retirement home for musicians and focuses on the four members of a once-famous quartet, played by Maggie Smith, Tom Courtenay, Billy Connolly, and Pauline Collins. It is a quiet, uneventful film but a lovely and quite funny one. While all four main characters give good performances, I loved that the film did not focus exclusively on them. There were glimpses of the other residents as well, as they worked to put together a gala showcasing all of their talents and hopefully succeed in raising enough money to run the house for another year. Michael Gambon’s turn as the flamboyant, snobbish operatic director in charge of the gala is wonderful – complete with a magnificently colourful and dramatic wardrobe – but it was lovely to also see the accompanists featured alongside the divas. This is a home for lovers and performers of all kinds of music, for big names and forgotten ones. And the house itself is gorgeous. I am half a century short of needing a retirement home but would happily live there now. Now, to ready myself for the coming week…but first a few hours with Trollope! Ahhhh, first a few hours with Trollope. What a wonderful prelude to the coming week – and how I love that painting. I agree, that’s a lovely room. I haven’t read Orley Farm yet – I look forward to hearing more about it. Gorgeous painting, and Orley Farm is one of my favourites. I remember the wonderful old film of Boeing Boeing with Thelma Ritter I think – still smile when I think of it! I’m so looking forward to seeing Quartet. Unfortunately, it’s not playing at any cinemas nearby so I’ll probably have to wait for the DVD. Question: how did you find the Dodie Smith? I’ve not read anything of hers apart from I Capture the Castle, which I’m so smitten with I have a difficult time believing anything else she wrote could hold a handle to it. A gorgeous painting of such a tranquil room … and yes, Quartet is wonderful! What a beautiful painting! It reminds me of my mother’s boudoir. I’m not interested in Bertie much either – seeing “The King’s Speech” was quite enough! I salute your courage in attempting to read a biography of him at all! On the other hand, I can’t wait to see “Quartet”: it sounds right up my alley, but it’s not showing in France yet. I’ll have to be patient. Sigh … I’ve been looking forward to Bertie! But I had the same experience yesterday. Finished the last two chapters of Pride and Prejudice, and then happily settled down with a new biography of someone I’ve never heard of, by an author I admire, and put it down again after two chapters. I’ll probaby come back to it, but only because it’s due back in two weeks, and I want to like it! I think we should blame this on the Super Bowl (or something else outside of our orbit). Beautiful painting! 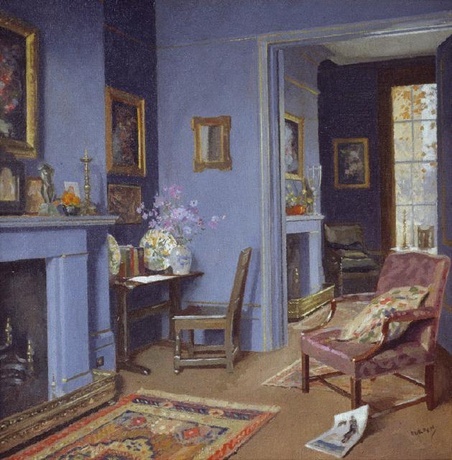 I love detailed paintings of interiors, and this artist is new to me. My husband and I saw Quartet this past Saturday and thoroughly enjoyed it. You had a weekend full of culture, Claire, and I am so envious of your Friday night – I love a good belly laugh at a farce! I remember seeing the movie ‘Boeing Boeing’ starring Tony Curtis and being quite amused. I may have to seek it out at my video store and watch it again for the laughs. I have not heard of the movie ‘Quartet’ but it sounds like one I don’t want to miss. What a wonderful cast. And now I see that it is playing at my neighborhood theatre. What luck. Love the painting. Something so soothing about a blue room. I’m having your same trouble with A Magnificent Obsession (about Victoria and Albert). I, too, think the trouble is sorely with me, and the fact that I haven’t had time to get into the book (at a time when I wasn’t exhausted). I think if I could get about 50 pages or so into it when I’m fresh, I’d be better off. Clare, I saw Quartet yesterday and loved it. What a lovely film. And I agree with you about being happy that the movie gave attention to all the residents of the home, not just the stars. Isn’t Quartet wonderful? I’m so pleased it was made. And OH what a gorgeous painting! Probably my favourite you’ve ever posted.